When a woman ordered a pizza from her local Domino's last week, she expected cheesy deliciousness, not cheesy unsolicited come-ons/harassment. But that's what she got. A few hours after Alice*, a 23-year-old from Stone Mountain, Georgia, had ordered and enjoyed a Domino's pizza, she received a text from an unidentified admirer who signed all of his missives with "$Bands$"
The first text read: "Did you have pizza today." When Alice repeatedly asked who $Bands$ was, he wrote "Guess" before "I delivered yo pizza seen you was fine and wanted to holla at you." When Alice asked where he got her number, he said "The caller id," even though she had placed her order online. "You got my number from your job?" she asked. "Yea can you forgive me i should of just asked," he texted. "You was looking good so i just wanted to see whats up"
But when we called Alice's new friend, he confirmed that he was a Domino's Pizza employee before hanging up. Tim McIntyre, Vice President of Communications at Domino's Pizza, was able to quickly identify him by contacting the franchise owner and said the driver would be terminated because "his conduct goes against everything we stand for." "I'm sorry that our customer experienced this kind of idiotic behavior and we do apologize to her," McIntyre wrote in an email. 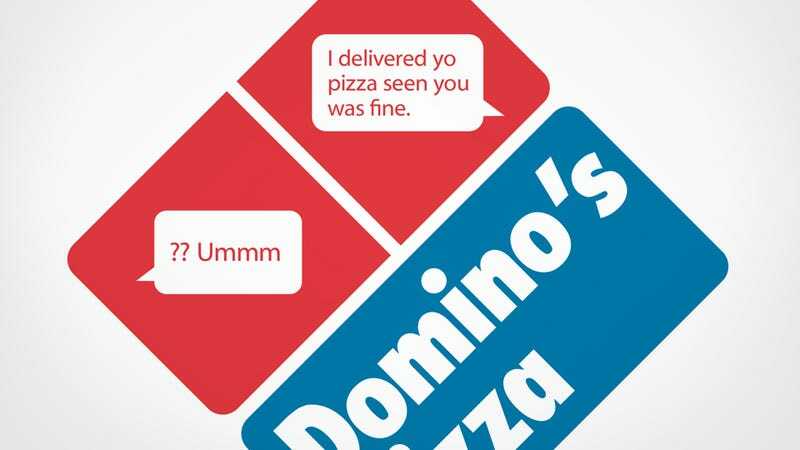 He explained that Domino's has policies and procedures in place to protect customer privacy and ensure that the company doesn't share or sell any customer information, but not against contacting customers "because it is essential in a delivery business to be able to do so" to verify orders or confirm an address. "Up until now, we've not needed to state explicitly that employees are prohibited from contacting a customer for any reason other than the transaction of business," McIntyre said. "We don't have a 'do not hit on the customer' policy because we've never needed one until now."